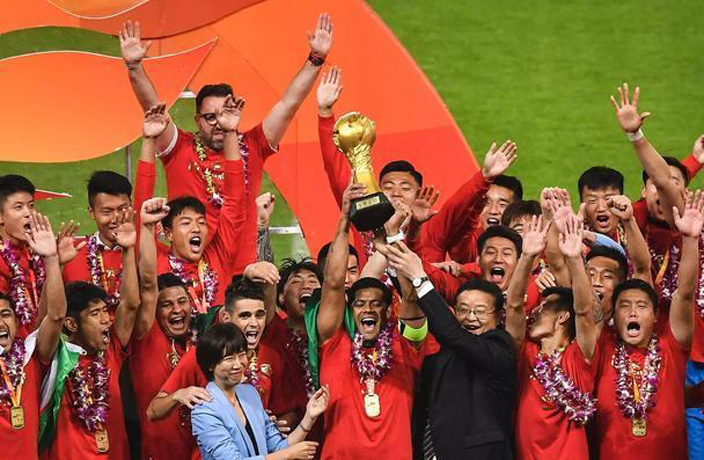 Shanghai SIPG sealed their first Chinese Super League title with a game to spare, with a 2-1 victory over Beijing Renhe at Shanghai Stadium last night. The win also brought to an end Guangzhou Evergrande's seven year dominance of the CSL. Only needing one point to claim the Fire-God Trophy, after beating Evergrande in a nine goal thriller at Tianhe Stadium on Saturday night, SIPG took all three for good measure. Goals came from a curling, dipping strike from Uzbek international Odil Akhmedov, and CSL top scorer Wu Lei's 27th goal of the season. Wu is set to become the first domestic player to be CSL top scorer since Li Jinyu in 2007. Makhete Diop scored a consolation for Beijing 25 minutes from time. The title is the first for a club only founded in 2005 out of Xu Genbao's Genbao Football Base on Chongming Island. They gained promotion to the top flight at the end of the 2012 season, while known as Shanghai East Asia, or Shanghai Dongya. The club changed their name to Shanghai SIPG for the 2013 campaign after being purchased by the Shanghai International Port Group. The league win comes in SIPG boss Vitor Pereira's first season with the club, succeeding where predecessors Andre Villas-Boas and Sven Goran-Eriksson had failed. "We have broken Evergrande's monopoly of the last seven years," said Pereira "That was an amazing challenge and we have done it. This is my first year in China and I'm very happy to be able to do this." Evergrande had won the title every year since gaining promotion to the Chinese Super League in 2011, but the misery of Fabio Cannavaro's team was further compounded on Wednesday by a 2-0 defeat at the hands of relegation battling Chongqing Lifan.